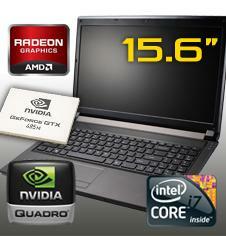 Eurocom (www.eurocom.com) launches the worlds most powerful 15.6-inch notebook ever! The EUROCOM Racer is a highly configurable, upgradable and extremely powerful small workstation-class notebook computer. It supports the newest Intel Sandy Bridge Processors and Huron River architecture, the newest GPU technology from AMD and NVIDIA. The EUROCOM Racer support high performance, high power VGA technologies up to a 100 Watt GPUs including NVIDIA GeForce GTX 485M, AMD Radeon Mobility HD6970M or NVIDIA Quadro FX 5000M equipped with 2GB of superfast DDR5 Video Memory. EUROCOM Racer also supports up to 32GB of high performance DDR3-1333 or DDR3-16000 memory required to heavy duty computing and/or virtualization. EUROCOM Racer is powered by a 180W AC Adapter which allows support for powerful GPU’s, up to 32 GB of RAM and Intel Sandy Bridge processors. EUROCOM Racer can be equipped with a Matte or Glossy Full HD 1920-by-1080 pixels 16:9 LED backlit display panels, 3D panels are also available as special order. “The EUROCOM Racer is the most powerful small workstation-class notebook, it is capable of much more than its size suggests. With the most powerful Intel Core i7 Extreme Mobile processors, high performance AMD Radeon HD6970M technology, NVIDIA GeForce GTX 485M and Quadro FX 5000M this platform is capable to provide a single computer solution for on-the-go Engineering and replace traditional bulky desktop based workstations" said Mark Bialic, President and CTO of Eurocom Corporation. •	Storage: up to 2 physical drives, SSD, hybrid or mechanical, up to 1.75TB of storage. The EUROCOM racer supports MXM 3.0b Video technology up to 100W. The EUROCOM Racer supports Intels newest Sandy Bridge processor technology. Eurocom is the world’s leading developer of desktop replacement and mobile workstation technology. Eurocom began with the goal of creating the most advanced computer systems and using advanced engineering techniques typically unseen in the computer industry. The company has produced many firsts and continues to engineer well-balanced machines and VGA solutions that inspire and enable individuals to reach great possibilities. For more information on Eurocom or to customize a machine, visit Eurocom.com.